Do you enjoy having hedges around your home? Whether you use them as a fence or you just really love the plants, you need to have them regularly trimmed. If you do not have the skill or knowledge in hedge trimming you should hire our professionals to do it for you. If you want your hedges to live long and be healthy hire our professional hedge trimming service and we will take care of your plants. 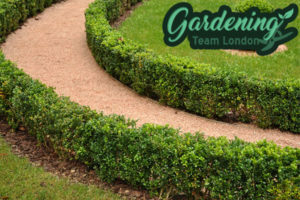 Our company is a reliable gardening services provider and we can send you a team of our competent professional gardeners and fully equipped and they will be promptly at your door, no matter where in London you live. Choose our service and we guarantee you your hedges will be growing strong and healthy with our regular maintenance. Our gardeners have been trained and are knowledgeable in their work, they know what each type of hedge plant’s trimming needs are and will take care of them. Depending on the species of your hedge plants they need to be trimmed and shaped with a different frequency. Our gardeners are well aware of that and will make sure your hedges are trimmed to the proper length (because sometimes if they are cut too short they can dry and die). What is more, our gardeners use special electric and hand trimmers for more precise results. You can be sure that your hedges will look the way you want them to. Our gardeners can renovate them, shape and maintain them as often as they need it. Turn to our professional gardeners for help and you will have ideally shaped hedges. Our gardeners are experienced and diligent in their work. 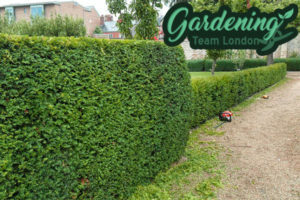 We guarantee you the most efficient and cost-effective hedge trimming service in London.